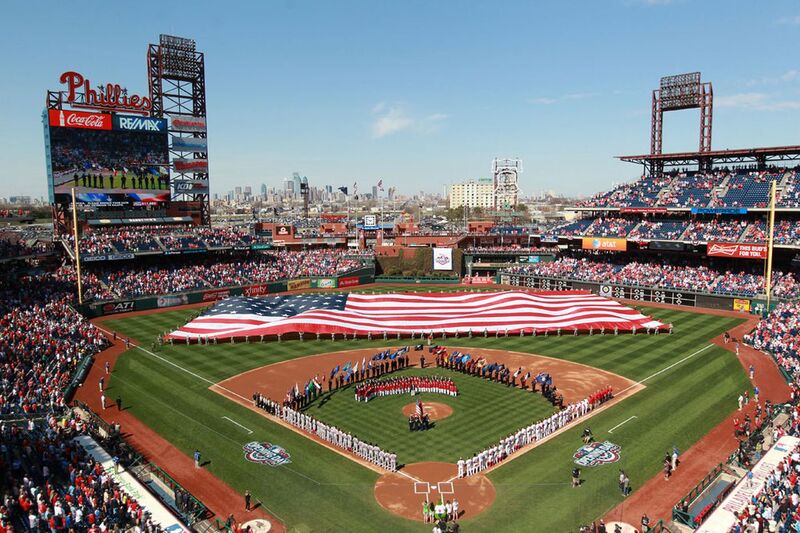 The Phillies 2019 season kicks off Thursday, March 28. This Saturday, March 30, marks Cavity Busters Kids Opening Day promotion, with a hooded T-shirt giveaway for kids under 14. Time was when sitting out in the sun, eating hot dogs and drinking beer with the promise of watching a double play or a home run was enough to get butts in Citizens Bank Park bleachers. The time was 2007 to 2011, the magical half decade when the Philadelphia Phillies won the World Series, two National League pennants, and five division titles. Phillies opening day: Can you guess how many home runs Bryce Harper will hit? Is Bryce Harper being Dominicanized with the Phillies? Since then, the team has relied on an ever-growing list of giveaways and theme days to goose ticket sales, such as bobbleheads from Star Wars (July 17) and Game of Thrones (May 13), postgame concerts (Avett Brothers, June 8; Brett Eldredge, June 22) and fireworks (July 12 and 13), and tributes to nurses (May 1) and military servicepeople (May 28), all of which you probably already know about. Here are some of the lesser-known but more interesting promotions. R2-D2 makes an appearance for the Phillies' Star Wars theme night. All the Turkey Hill Ice Cream and Rita’s Water Ice stands in the ballpark will be closed on cavity busters day, right? No, actually, local pediatric dental chain Cavity Busters is just helping finance this day’s T-shirt giveaway in exchange for publicity like this. This is the first in a series of pregame programs inviting college students with an interest in sports (but no athletic ability) to network with back-office Phillies personnel about potential job opportunities (thus explaining the 200 twentysomethings in suits you’ll see kicking back at the ballpark on this and the other eight #CollegeSeries evenings). There are four dollar-dog nights at Citizens Bank Park this season. Expect exponentially more consumption. The Phillies lure frat boys and girls to the ballpark with the offer of two-for-one tickets in a promotion I would place in the Department of Looking for Trouble. You don’t technically have to be in a fraternity to take advantage of this ticket deal, but be warned: You may well have to sit in their section. The topic of the aforementioned Phillies #CollegeSeries being held this same evening is (probably not coincidentally) stadium security. Seniors get to stroll the bases at April 17's Phillies game. This evening is a 55-plus slow-pitch variation on the Phillies’ popular Kids Run the Bases promotions (where under-15-year-olds are unleashed onto the infield after the game). April 17 is also one of three After Tax Day Discount games, making this bit of exercise more affordable for people on fixed incomes. This Han Nola bobblehead will be one of the giveaways at this Phillies season's Mystery Bobblehead theme night. No, it’s not a Snoopy theme. The Peanuts comic strip has its own night and bobblehead giveaway on July 31. This is instead the enigmatic name for five times this season (May 18, June 7, July 28, August 16) when a few private ballpark suites are set aside for people with peanut allergies at a reduced price. Celebrity meteorologists from NBC-10, Telemundo 62, and the Franklin Institute set up their instruments on the ball field to teach 170 busloads of schoolkids about the weather, followed by lunch and an afternoon game for a mere $20. This event is rain or shine, natch. Famous meteorologists take the field rain or shine for the Phillies' Weather Education Day game. Not to be confused with Red Goes Greek night (unless you’re a frat boy of Greek heritage), this is the Greek edition of a series of game days honoring ethnic groups that make up our local populace (and, the Phillies hope, coax them into the ballpark) with themed food and pregame entertainment. Other promos celebrate Irish, Italian, Jewish, Latino, Asian, and German heritage. Though presumably well-aware of the December 1968 Sunday when Philadelphia sports fans earned their world’s-meanest pinstripes by booing Santa at an Eagles game, the Phillies are bringing in Santa and Christmas carolers and decking the park in tinsel and holly for some out-of-season fun. Unless bad weather or poor play brings out the ugly in us. The Phillies let fans onto the field’s warning track before the game to take pictures while the players file by (and pause to pose, if they’re unknown enough). And in case the photo ops and the game itself aren’t big enough draws, the players will be sporting ’70s uniforms. While Phillies promotional giveaways like T-shirts and dollar dogs are free to all ticket holders, themed discounts and prizes (#CollegeSeries, bobbleheads) are limited to people who buy a theme-day seat at phillies.com/themenights or by calling 215-463-5000. Beware the varying price differences.